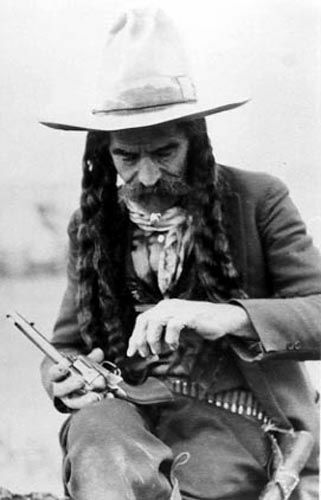 Frank Boardman “Pistol Pete” Eaton (1860-1958) – Cowboy, Indian fighter, U.S. Deputy Marshal, scout, and author, Eaton was born on October 26, 1860 in Hartford, Connecticut. When he was eight years old, he moved with his family to a homestead in Twin Mounds, Kansas. That very year, his father, a Union Army veteran, became involved in a dispute with several Confederate men who had ridden with Quantrill’s Raiders during the Civil War. A short time later, six of these men appeared at their home and Frank’s father was shot in cold blood right in front of the boy. Encouraged by a family friend to avenge the death of his father, the friend began to teach young Eaton to handle a gun. That same year, wanting to learn even more about handling a gun, he visited Fort Gibson, Oklahoma. There, instead of learning anything more, he began to compete with the some of the cavalry’s best marksmen, beating them every time. His reputation as “packing the truest and fastest guns in Indian Territory” was born. Frank then began to search for the men who had killed his father years before and legend has it before he was done avenging his father’s death, he had tracked down and killed five of the six men who had been involved in the murder in 1868. The last man had been killed in a card game and all had lived lives of crime. At the age of just 17, he was one of the youngest U.S. Deputy Marshals to have ever been commissioned in the Western District at Fort Smith, Arkansas. Serving under “hanging judge,” Isaac Parker, his territory extended from southern Kansas to northern Texas. He made his home in Bartlesville, Oklahoma and soon had a girlfriend named Jennie who gave him a crucifix to wear around his neck for protection. The girl must have had a premonition as the crucifix actually saved Eaton’s life on one occasion when it deflected a bullet that the lawman he would have taken in his chest. Frank would later write of this, “I’d rather have the prayers of a good woman in a fight than half a dozen hot guns: she’s talking to Headquarters.” Unfortunately, Frank never got the opportunity to thank Jennie, as she died of pneumonia. He buried the cross at the head of her grave. When he was 29, he joined the Oklahoma Land Rush and settled southwest of Perkins, Oklahoma where he served as sheriff and later became a blacksmith. In August, 1893, he married a woman named Orpha Miller of Guthrie, Oklahoma and the couple had two children. Unfortunately, she died of a lung disease seven years into the marriage. He remarried in December, 1902 to a woman named Anna Sillix and the couple would eventually have another eight children. Frank would continue to serve as a marshal, a sheriff or a deputy sheriff until late in life. 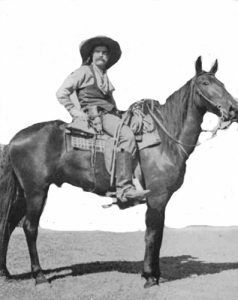 By the time his career as a lawman was completed, he reportedly had some 15 notches on his gun belt. Later, he wrote two books, telling the story of the Old West. The first was an autobiography entitled Veteran of the Old West: Pistol Pete, which tells of his life as a U.S. Deputy Marshal and cowboy. His second book, entitled Campfire Stories: Remembrances of a Cowboy Legend wasn’t published until 30 years after his death. He continued to carry his loaded pistols until his death and was still said to be extremely quick on the draw when he was in his nineties. He died on April 8, 1958 at the age of 97. During his lifetime, he was married twice, had ten children, 31 grandchildren, and several great-grandchildren. The phrase “hotter than Pete’s pistol,” traces back to Eaton’s shooting skills and his legendary pursuit of his father’s killers. Frank is honored as the mascot for Oklahoma State University, signifying the Old West and the spirit of Oklahoma. In March, 1997, he posthumously received the prestigious Director’s Award at the National Cowboy Hall of Fame. My Dad was born, raised and graduated from Perkins High School in 1935. Sometime in the late 30’s the family moved West and wound up in Marana, AZ. I was born in 1941 and raised on a cotton farm there. I recall my Dad telling me at some point that Frank was cross eyed but could kill a fly on the wall of his blacksmith shop with a gunshot. He also told me that at some point when Frank was a sheriff, he received word somehow that some hoodlums might be traveling through the area. He deputized my grandfather, and maybe others, and set up a roadblock at the ‘T’ in the road just North of Perkins. Frank was to position himself out of sight and appointed my Grandfather to be the one to approach the car to check for the suspects. He also told him that if anyone in the car flinched, he would shoot them between the eyes. My Grandfather apparently had no fear. The hoodlums did not go through the road blocked intersection. I received my PhD in Entomology at Oklahoma State University, just 10 miles North of Perkins. My Dad had a relative still living in Perkins and every Sunday afternoon my wife and I were invited to their home for a fried chicken dinner. Can’t beat that!! What an interesting family history Bob. Thanks for sharing! !